My Disposable Crisis Project made it to the Newspaper!! Sorry for spamming all of you with this project but I’m just so happy! Miguel Essers, who also designed the project’s website, introduced it to Stefan Gybels from Dagblad de Limburger / Limburgs Dagblad. I had an appointment with him yesterday to talk about it and he was very enthusiastic about the project. This lead to an article in the newspaper! It’s in Dutch only, sorry! This entry was posted on February 29, 2012 by Contrastique. 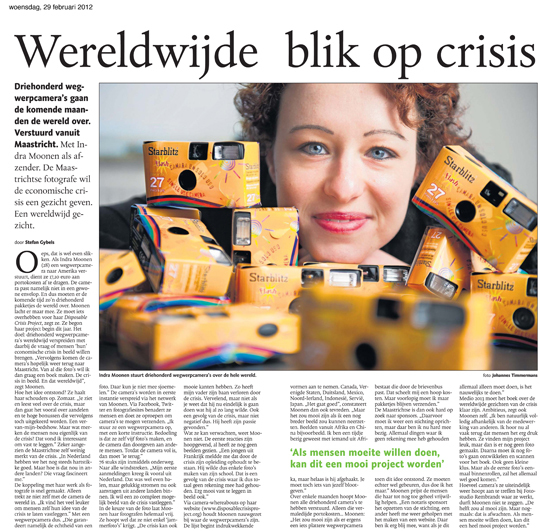 It was filed under Publications and was tagged with dagblad de limburger, exposure, limburgs dagblad, media, miguel essers, stefan gybels, the disposable crisis project.